Once founded upon cheap fuel and free womanpower, America’s suburbs are rapidly evolving — just as have the women who live there. Suburban women can no longer be stereotyped. In today’s America, they are no longer necessarily stay-at-home mothers, who spend their days chaffeuring their youngsters from one sports activity to another, gardening, shopping or volunteering for local charities. Nor are they necessarily married. Whether single, married or divorced, well over half of all suburban women now work outside the home while their children grow up with day care or baby sitters and attend after-school programs. The tradition of suburban coffee klatches, of women volunteers and those who proudly sign ” housewife” on their tax forms have dwindled, as increasing numbers of women remain in the workforce. 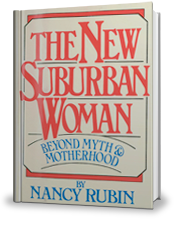 The New Suburban Woman, published in 1982, and based upon the lives of 400 women interviewed from New York to California as the suburbs evolved from traditional bastions of home and hearth into vibrant, multi-faceted communities, captures the shock waves felt by many residents that resulted in a ” cold war” between stay-at home mothers and those who worked outside the home. The New Suburban Woman is a journalistic snapshot of the American dream as it evolved from a tranquil domestic retreat on the perimeter of the city to bustling communities with jobs, recreational activities and childcare facilities.